From Friday, April 15, Kaikai Kiki Gallery will present “The World is A Beautiful Place (We’re Not Hear For Long),” a solo exhibition by Friedrich Kunath. The show is Kunath’s second with the gallery and his first in Japan in six years. 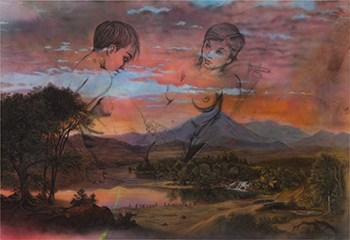 Kunath works in a variety of mediums, including photographs, video, and sculpture, and this particular exhibition evokes the theme of twilight eros with over ten new works. In these works I present landscapes that provide a window into an idealized world, that are then transposed with another world: the less ideal personal perspective, an inner turmoil. I’m interested in historical images that depict visions of harmony within nature because they force one to confront one’s own less harmonious reality. The long forgotten exterior, the romantic landscape, is reborn through the way I paint on top of this preexisting notion. I’m interested in the stark contrast between a private interior world and the exterior idealized world, and the works become the arena for these two sentiments to play out with each other. Friedrich is an artist I greatly admire and I personally own a number of his works. I couldn’t believe he would do a second show with us; I’m so touched by his graciousness. Thank you, Friedrich!! I’m tremendously envious of his style… that is, the ironic romanticism of his work. Please come experience such a worldview yourself!